Predictive marketing is gaining momentum among marketing organizations seeking better ways of scoring leads. It goes hand in hand with the rise of Account Based Marketing (ABM), which, at its heart, is about focusing marketing efforts on a highly targeted prospect with a tailored, personalized message. B2B marketers can augment their ABM strategy with predictive marketing, which provides non-intuitive insights about customers and prospects, enabling more precise personalization of both the message and the means of outbound communications. Download this whitepaper to develop a better understanding of how you can integrate predictive methods into your marketing outreach. To find out how DemandGen can become your team’s partner, contact us! 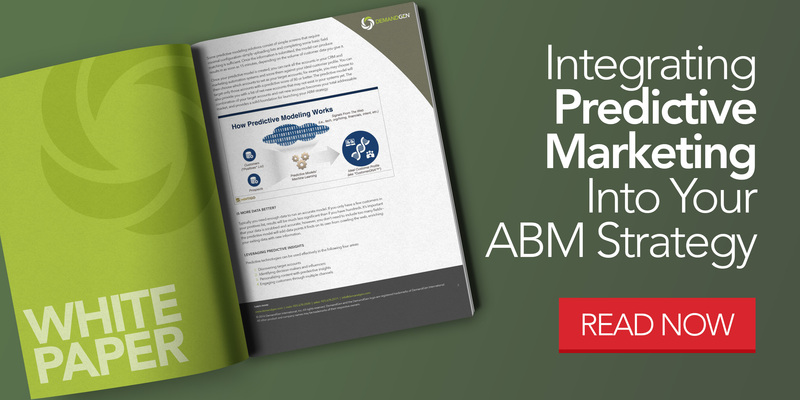 For more information on ABM and lead scoring, check out our additional resources.